If you are an NGO working in the broad medical/healthcare sector in Africa, we want to pass the message that our Medcera technology is available to support your mission. Medcera is our full intellectual property, and we can customize, adding any feature you need. If you are working say on polio and need specific ways to collect records in the field, let us know; we would work to help in Medcera. We already have Encounter in the Medcera physician portal. We only require one thing: everything must be done under the supervision of a licensed physician who must implement necessary patient privacy as stipulated by the local law. Medcera has ways to make such happen but the lead physician must design the controls in the practice/facility admin account. 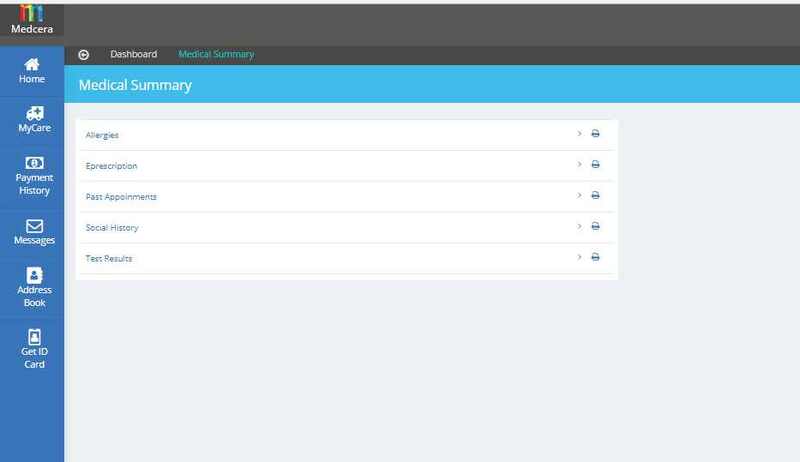 Medcera is a cloud-based electronic medical record / health record system with both patient and partner management engines. It delivers services and is engineered to become a healthcare operating system for Africa. Besides, Medcera can put your brand in a sub-domain. For example, you can have HealNGO.Medcera.com, and from there, your team and others can relate on your mission, powered by Medcera technology. From login to customizing your presence, we ensure you have the technology you need to execute your mission. It launches Aug1, 2018. Some images from the patient module.